It's not often that I make something that doesn't go down well with J. His ability to eat and enjoy almost everything is astonishing. I'm incredibly picky about what I eat, whereas he's the exact opposite. There's not much he doesn't like. When, on the odd occasion, I hear loud spluttering noises coming from the kitchen I know I'm done something monstrously stupid. I may have mixed up the salt and the sugar or accidentally added two tablespoons of baking soda when all I needed was two teaspoons. You get the gist. So, when I heard said spluttering noises coming from the kitchen last night I was incredibly confused. I knew I hadn't left anything I'd made on the counter to be gobbled. I rushed in to see what was the matter - hoping J wasn't dying or something equally dramatic. Imagine my surprise when I find him waving his arms around and pointing at the amaretti biscuits I've left neatly (ahem..) in their packet. "Whoa, what's wrong?" I said. "Those biscuits!" he said, "They're awful!" "No, they're not" I tell him "they're just awful strong." It seems I managed to find something J doesn't like. In fact, I would go so far as to say I've found something he loathes. I don't mind though, the ice cream I used the biscuits in turned out quite nice. Slightly on the creamy side of too creamy, but nice none the less. 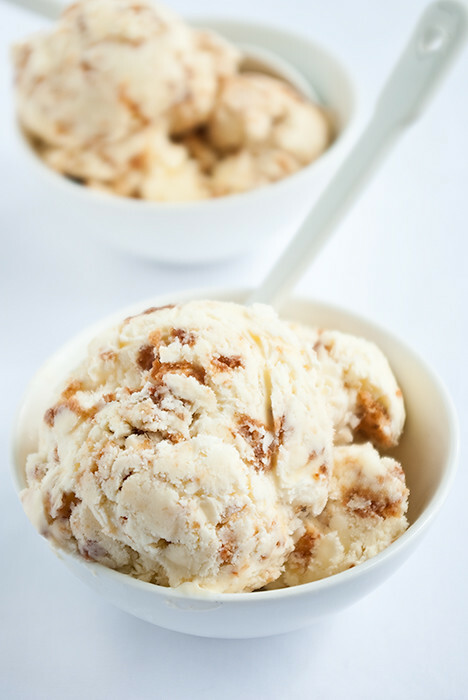 The recipe was originally for a no-churn ice cream but I decided to churn half of mine for fun. As expected the churned half is less icy. The non churned half isn't had either. Honestly, sometimes I prefer not the share. This time is one of them. Place the creams and icing sugar in a bowl and beat with electric beaters until soft peaks form. Gently whisk in the amaretto and vanilla, then chill until required. Place the egg whites and salt in a bowl and beat until soft peaks form. Remove the cream from the fridge, give it a quick whisk if it has lost some of its body. Gently stir in the biscuits, then fold in the beaten egg whites. Pout into a 2 litre container and chill for 6 hours, or until firm. Place the creams and icing sugar in a bowl and beat with electric beaters until the cream reaches the ribbon stage. Whisk in the amaretto, vanilla, and salt, then gently fold in the egg whites. Chill until cold. Remove the mixture from the fridge and churn according to the manufacture's instructions. Add the amaretti biscuits in the last few minutes of churning. Transfer the ice cream to a two litre container and freeze for a minimum of 2 hours. 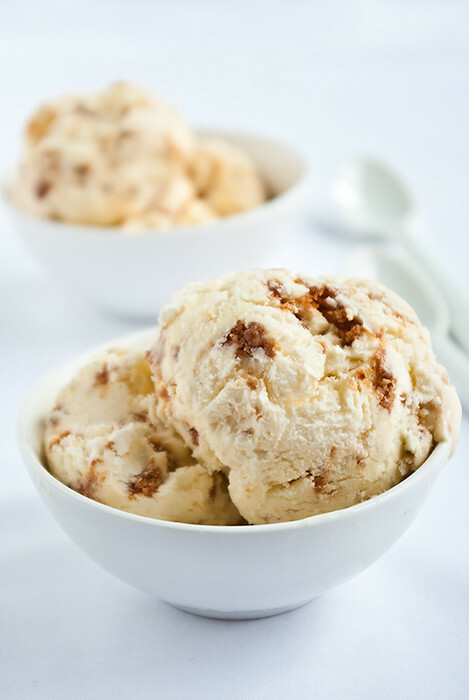 I love this ice cream because I love amaretti cookies! Probably one of my best! This ice cream looks so creamy!!!! This looks delicious - that picture is beautiful! olá|! !adorei..parabéns!gostaria de receber suas atualizações. Kim: Creamy is definitely a word I'd use to describe. Almost too creamy, if that's even possible. Patricia: If it could make it all that way without spoiling I'd give it to you! Ovenhaven, Coffeeanddessert, Megan, & Carol: Thank you all for your kind words!